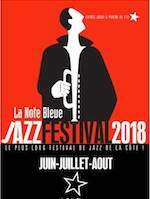 In the jazz lounge, two performances, on 31 August and 1 September, by singer and guitarist Hyleen, closing the Note Bleue summer jazz festival. Hyleen is accompanied by Nicolas Viccaro on drums and Julien Boursin on keyboards. The are performing tracks from the forthcoming album B-Side, to be released on La Note Bleue Productions label.